Consistent edge hold, longer lasting edge. Preferred for freestyle, and all mountain riding (note that for riding rails dull edges are often preferred as they will not catch as easily). All new Prior freeride/freestyle and splitboards are factory finished with 90 degree edges. Preferred for riders who desire more edge hold. Prior alpine boards and skis are finished with 89 degree edges. Note: The file that usually comes with the tool is quite coarse and will take off quite a bit of edge material - use sparingly. Consider replacing with a less coarse file to increase edge life. With your board in the vice on its side, place the file guide on the board so the file is on the side edge and the guide can glide smoothly along the base (as an advanced technique, you can tape the base of your board so you don't grind filings into your base). Use long smooth strokes with the guide and make sure the guide part of your tool stays flat to the base, so after filing you will have a clean and smooth, consistent side edge. Your base edge is a much easier process. To start with, wrap your file's pointy end with 3-4 layers of masking tape. This gives you a bit of base edge bevel. This base edge bevel will lift your base edge off the snow a bit and make your board act a little more predictably on cat tracks and traverses. With the pointy end in one hand, start at one end and pull smoothly towards you, and note how your base edge gets cleaner and sharper. For best results we recommend to work from the tip to the tail. Your file, as it sharpens, creates a tiny micro-burr along the entire length of the board. It is a good idea to remove those tiny burrs with a diamond stone. Added precision is possible by inserting your diamond stone in your file guide. The finished edge should still feel sharp, but will not cut your skin if you run a finger along the edge. Note: Carry your diamond stone while you are on the hill so you can polish any nicks that you might put on your edge on the mountain. 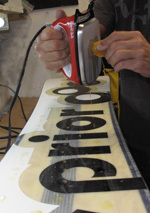 Regular waxing is crucial for snowboard performance and protection. Waxing is relatively easy to master. Racers can spend a fortune on wax. Temperature, snow moisture content, elevation, and type of snow all play a part in choosing the right wax. More technical information is available from wax companies such as Toko, Kuusport etc. For everyday riding, we recommend a reasonably priced, all-purpose, universal temperature wax. 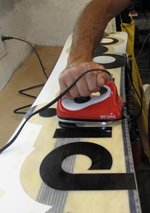 Using an iron, (preferably without steam vents) drip wax on the base of your board. Use a low to medium temperature on your iron to prevent the wax from burning and/or smoking. After dripping, iron and spread the wax onto the base of your board, making sure you keep the iron moving to avoid melting/burning your base. Spread/iron evenly from tip to tail over the entire board, and then let cool. After the board has cooled, scrape off the excess with a plastic scraper. To improve your glide, finish by brushing your base to bring out its structure. Scotchbrite, a hairbrush, or a special "structurebrush" will do the trick.